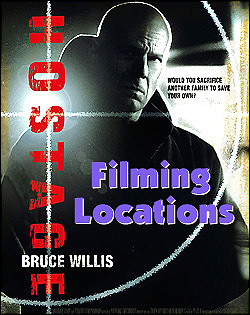 Actual Southern California locations where the 2005 film "Hostage" was shot. The film starts with a hostage situation in a residential home, which ends tragically. A distraught man has barricaded himself in his home, taking his wife and young son hostage. man on a cell phone, trying to convince him to give himself up. (at the northwest corner of S. Utah Street & Mono Street), in East Los Angeles. is, in reality, located just to the south of the home, at 210 South Anderson Street. It is "California Costume Collections Inc"; it manufactures costumes and toys. The central drama begins when a group of creeps spot 'Jennifer Smith' (Michelle Horn) entering a local market. She returns an obscene gesture from one of them, and they follow her home. in the Malibu area. The market is actually the Country Natural Food Store, at 415 S. Topanga Canyon Blvd. (see the photo below - the red awning to the right). of Kim's market, at 2960 Tuna Canyon Road, in the Topanga area, near Malibu. and her brothers hostage (and shadowy figures force Bruce to try to rescue them). place at the Canyon Inn. The Canyon Inn is real, but it's a long way from Malibu - about 50 miles east. The Inn was actually at 2280 N. San Gabriel Canyon Road, in the hills of north Azusa. The photos on this page are stills from the DVD of "Hostage"
(which you can buy by clicking here) and are copyright Miramax Pictures.